Our 6th and final TasteVino Selections Asado was slightly bitter sweet as it was the last for our TasteVino Wine Club. Never fear, we will continue to hold an annual Asado with SMOKE creating this beautiful event. Chef Morgan and team cooked a lamb on the cross. Our local farmer and friend, Paul Tarap from Stewart Ranch, provided us the lamb. The meal also included traditional argentinean sides paired with our latest vintages of wines from our winery partner Familia Deicas. Click here for more images from the event. Getting Excited for BottleRock Napa Valley! White asparagus is here, which means spring is on its way! Preheat oven to 350°. Peel, seed and dice delicata squash in 1/4 cubes. Toss the squash with olive oil and place on a baking sheet. Bake at 350° for 15 minutes or until tender. In a large mixing bowl whisk together the half & half, egg yolks, sugar, and vanilla until smooth. Fold remaining ingredients making sure the bread is moist. In a 4oz. cupcake baking pan, butter each cup and spoon mixture in. Bake for 25 minutes or until a toothpick comes out clean. Serve with cinnamon ice cream. Check out our great Thanksgiving recipes coming throughout the week! 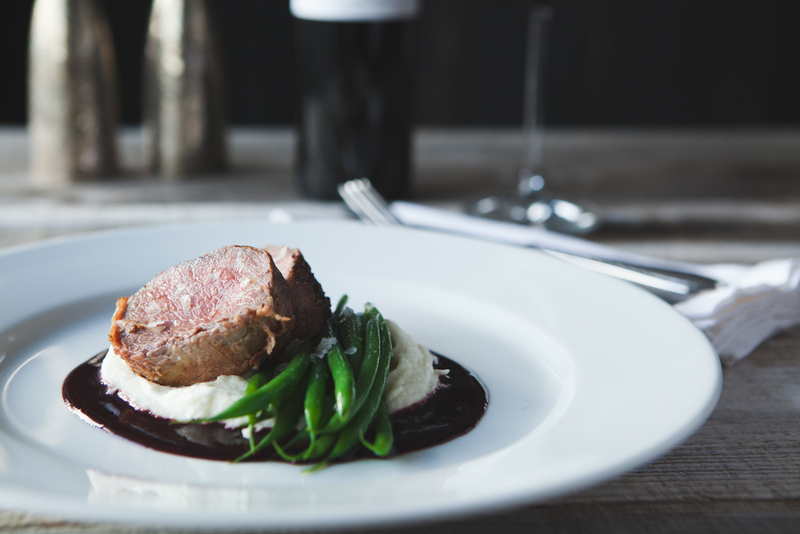 Contrary to popular belief, “refined” is not that far removed from “rustic” when it comes to cuisine. People often assume that “rustic” food is prepared by throwing all of the ingredients together; but in fact, the same preparation and thought goes into rustic as into “refined,” and, on occasion, more! Rustic typically connotes ingredients folded together or cut with rough edges, then carefully placed on a plate or platter to make it appear as though they naturally fell there. A great example is a mixed grain dish, such as this farro salad: the ingredients have been tossed together, but just before serving you’ll notice how I mound the mixture into the bowl, to bring height and structure to the presentation. The effect is “unintentional,” yet it always looks perfect. Refined is the simple act of respecting each ingredient, keeping them separate until the very last minute – then pulling them all together. For some examples, look at the presentation of this Pancetta-wrapped Broken Arrow Ranch venison Loin, with Fondue Potatoes and French Beans in a 12-Bottle Cabernet Reduction Sauce; or this California Rock Cod with Cioppino Sauce, Manila Clams, Prawns and Bread Crumbs, which doesn’t look like a stew (rustic) but more like a bowl of seafood jewels, prized for their individual qualities (refined). Even simple “Bacon and Eggs” achieves refinement in this beautiful composition of Cured and Smoked Heritage Pork Belly, Black Eyed Peas, Quail Egg and Natural Jus. Refined dining is just as much a feast for the eyes as it is for the palate. My food often represents bits of rustic as well as refined. Why? Because it’s the most approachable. It should never feel like you tried too hard, but then again it should have substance – and show the love. When you’re an entrepreneur, you are always on the lookout to combine any leisure activity with a business agenda – because, even when you’re on vacation, you are consumed with what you do. So it is with Morgan and our family: a recent Robinsons “Spring Break” adventure to California’s central coast included a visit to Morgan’s family in Santa Barbara, paired with a makeover opportunity for the SMOKE Open Fire Cooking workhorse, the five-by-ten-foot grill on wheels. 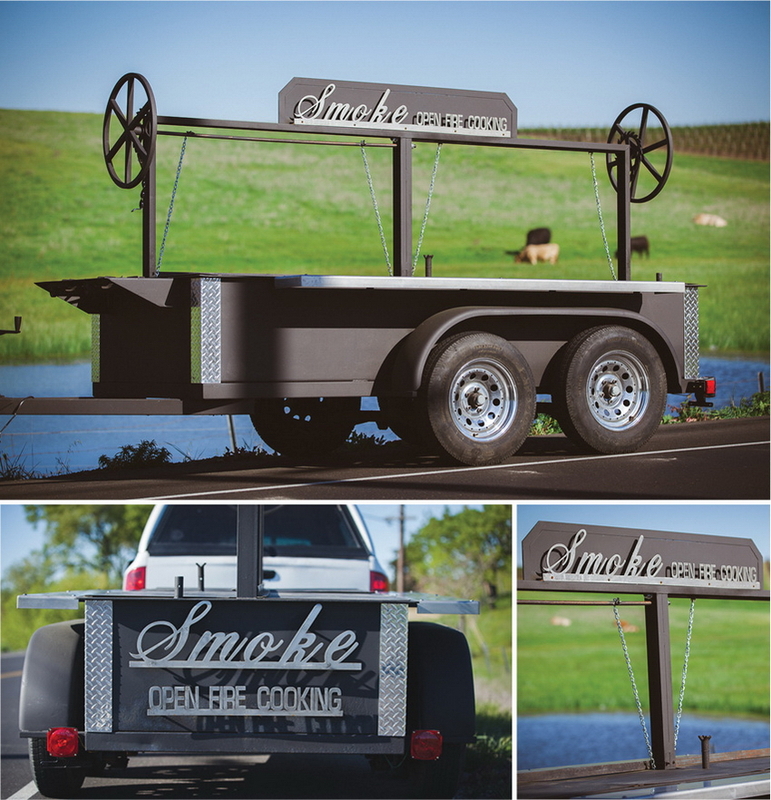 This grill, or “rig” as we call it when it’s hitched to the back of the truck, was custom-built by Santa Maria BBQ Outfitters. Rolling into the grill’s manufacturing headquarters in Santa Maria en route to Santa Barbara, I was hit with a strong memory: It’s hard to believe that just six years ago this grill was the inspiration for Morgan’s large-scale open fire cooking/catering concept! The Big Idea: In order for Morgan to deliver a Napa Valley restaurant casual elegance that many of his winery and consumer clients were seeking at catered events, the grill would serve as a portable kitchen – enabling him to cook fresh, local artisan ingredients onsite over an open fire, and serve the finished dishes immediately – just as it’s done in a high-end restaurant. This is in stark contrast to traditional catering establishments, which cook the food in a catering kitchen, then transport it to the event site, then reheat and serve. Getting back to the rig: We picked it up at the end of our vacation, on our way back to Napa. Check out the grill makeover! Besides the incredible job the company did on the branding , its crew repacked the wheel bearings, painted and tuned the entire rig, and replaced the crank system wires with chains. The rig cruised back to Wine Country in style! Watch as Morgan talks about why he loves cooking with fire.